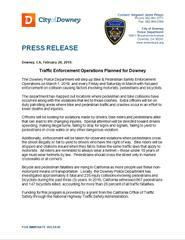 The Downey Police Department will step up Bike & Pedestrian Safety Enforcement Operations on March 1, 2019, and every Friday and Saturday in March with focused enforcement on collision causing factors involving motorists, pedestrians and bicyclists. The department has mapped out locations where pedestrian and bike collisions have occurred along with the violations that led to those crashes. Extra officers will be on duty patrolling areas where bike and pedestrian traffic and crashes occur in an effort to lower deaths and injuries. Officers will be looking for violations made by drivers, bike riders and pedestrians alike that can lead to life changing injuries. Special attention will be directed toward drivers speeding, making illegal turns, failing to stop for signs and signals, failing to yield to pedestrians in cross walks or any other dangerous violation. Additionally, enforcement will be taken for observed violations when pedestrians cross the street illegally or fail to yield to drivers who have the right of way. Bike riders will be stopped and citations issued when they fail to follow the same traffic laws that apply to motorists. All riders are reminded to always wear a helmet – those under 18 years of age must wear helmets by law. Pedestrians should cross the street only in marked crosswalks or at corners. Bicycle and pedestrian fatalities are rising in California as more people use these non-motorized means of transportation. Locally, the Downey Police Department has investigated approximately 8 fatal and 235 injury collisions involving pedestrians and bicyclists during the past three (3) years. In 2016, California witnessed 867 pedestrians and 147 bicyclists killed, accounting for more than 28 percent of all traffic fatalities.